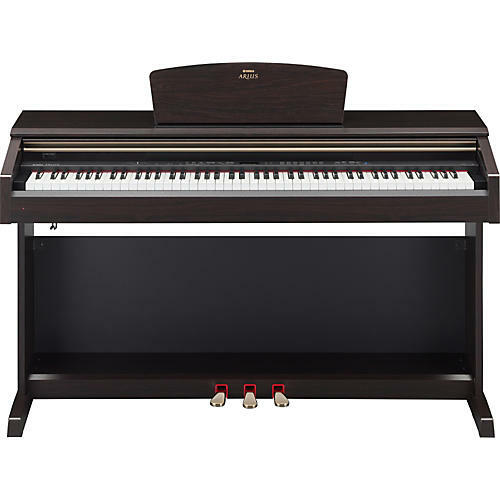 The Yamaha Arius Series provides true piano sound and feel. The graded-hammer keyboard of the Yamaha Arius YDP-181 digital piano makes it a true joy to play both in practice and in performance. The 3-level AWM dynamic stereo sampling voices deliver remarkably authentic sound. Moreover, the damper pedal includes a half-damper effect, giving you nuanced expressive control over the sustained sound. The Yamaha Arius digital piano's dual voice capability lets you play two different instrument sounds at the same time, while a 2-track song recorder allows you to capture original musical ideas and performances. Comes with Headphone Hanger, Song Book "50 greats for the Piano" and BC-100 Standard Bench. Just as on a traditional acoustic piano, lower notes on a GH keyboard have a heavier touch while the higher notes are more responsive to lighter playing. The Yamaha Arius digital piano's GH keyboard features an extra key sensor capable of reproducing fast, repetitive playing of a single note with perfect articulation. The 88-key Yamaha Arius digital piano comes equipped with AWM (Advanced Wave Memory), a sampling system that creates the realism of an acoustic instrument by using digital technology to record the instrument sound and apply high-quality digital filter technology to the recorded audio samples. The waveform of the sound created by playing the key of an acoustic piano differs depending on the playing strength from pianissimo to fortissimo. AWM dynamic stereo sampling can produce dynamic nuances by recording samples of various playing strengths. The greater the number of samples used, the higher the expression. Damper resonance samples provide the rich and broadening tones produced in pedaling. Using these comprehensive gradations, the Yamaha Arius YDP-181 can realistically reproduce the complex sounds of a grand piano. The electronic piano's built-in, 2-track performance memory allows you to record a backing track and then step into the spotlight and solo over it. Best of all, you can change tempo or voices even after you've recorded your performance. The Yamaha Arius digital piano also a built-in metronome to help you stay in perfect time. The Yamaha digital piano also has a selection of 50 different piano songs built-in for your listening pleasure. These recordings were chosen for their beauty as well as their functionality. Since many of the songs are classic piano pieces, anyone taking lessons can use them as a reference.